Our badges & patches tailored on the finest leather have lots of customer in the global markets. The high level embroidery done on them is really appreciating. No where else you will get such a fine Embroidery On Leather at the minimum cost that the company charges from its clients. We are known to give more satisfaction than just delivering the targeted assignments worldwide. The design on this leather is of entwining leaves. Because the primary color is black, the focus is concentrated on the intricate design. The wearer of this badge will create an appearance of magnificence and nobility. Additionally, this particular badge is known for this durability and strength. It can be stitched onto any material easily. The superb finishing touches really set this badge apart. 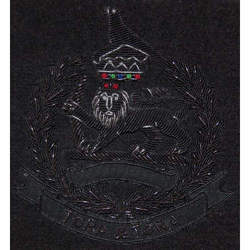 This emblem on black leather is of a lion, crown and the motto ‘Tora & Tora’ All three features suggest royalty, and imply success. Additionally, the use of color to embellish the jewels on the crown really serves to make the design stand out. The badge is elegantly designed and will add a touch of masculinity to your outfit. The badge is extremely easy to stitch on and have been made with the highest quality raw materials. The design is extremely attractive. 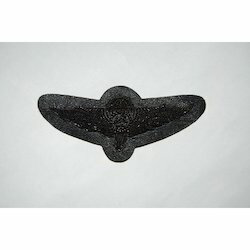 This leather badge has a unique shape that symbolizes a bird in flight. The design is on black leather, and this badge would look elegant on any outfit. The use of high quality leather and precise stitching truly add a touch of class. The badge is washable. The finishing touches add to the beauty of this badge, which is can be easily stitched onto any outfit. There is no chance of any wear and tear showing on this badge. The stitching is durable. 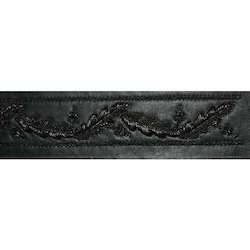 Looking for Embroidery on Leather ?